This week, I posted a tweet about the extremely low levels of volatility in the bond markets. The main message of that tweet was that we are experiencing a rare situation in which the realized volatility of high yield bonds is lower than the realized volatility of credits. In most cases, the risk of high yield bonds is higher than the risk of credits, since the chance of default is, by definition, higher for bonds with lower credit ratings. A possible explanation for the lower realized volatility of high yield bonds could be a difference in duration. And, indeed, the duration of global credits has risen steadily over time, while the duration of high yield bonds went in the exact opposite way. This development explains at least part of the convergence in volatility in credits and high yield bonds. But I believe that expectations about default rates, which are also extremely low, are of more importance. The two years duration gap between credits and high yield bonds seems too small to fully explain the collapse of the high yield bond volatility. 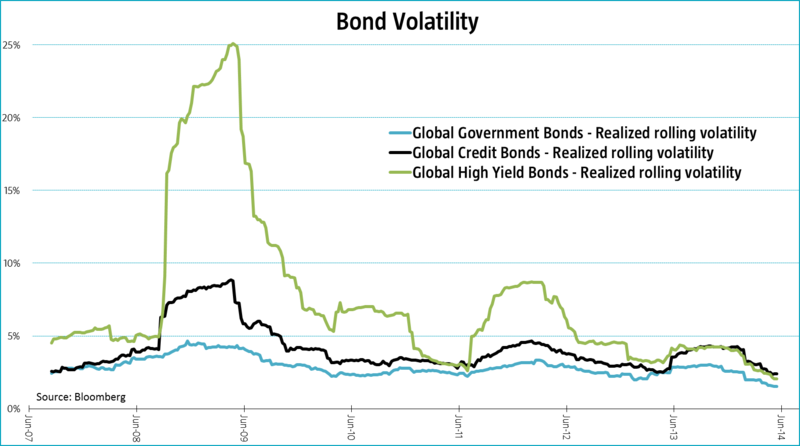 The historically low volatility on high yield bonds does not come for free, however. The graph below shows that the additional yield, or spread, you receive on high yield bonds, compared to credits and government bonds, is also at historically low levels. Only, during the period between 2005 and 2007 (not shown) were spreads even lower. Hence, the traditional risk-return relationship seems to be intact. But, is the current low risk of high yield bonds enough to compensate for the low yield? To get an indication of the answer to this question, let’s take a quick look at the Sharpe ratios (based on realized risk and constant yields going forward). 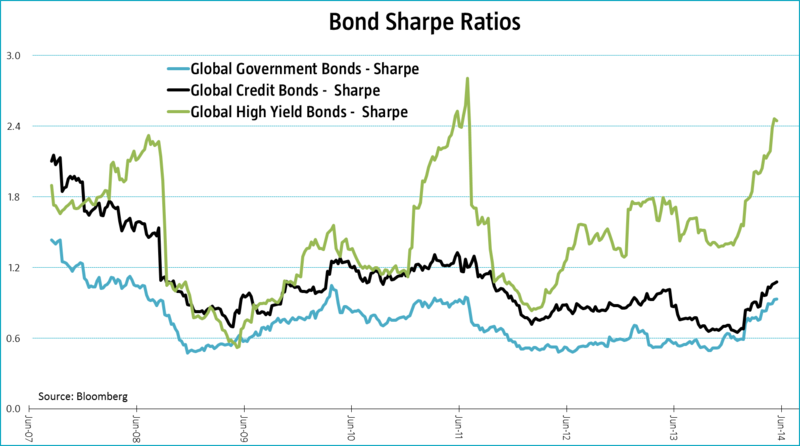 The next graph shows the Sharpe ratios for government bonds, credits and high yields bonds. 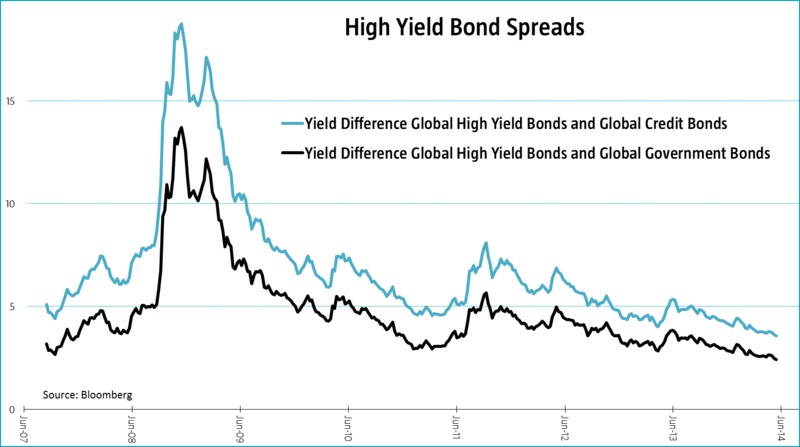 The chart emphasizes that the current level of risk of high yields bonds is even more extreme than the current spread level. Since the start of this year the realized volatility of high yield bonds has started another leg down, even crossing the volatility of credits, pushing the Sharpe ratio up sharply. A Sharpe ratio of over 2 is not very common (for instance taking the average realized volatility on high yield bonds over this data sample would leave a Share ratio of just below 0.7, much more in line with long-term averages). A few remarks to conclude. This simplistic Sharpe ratio assumes the level of risk will remain so low going forward, even though it is at an extreme level, and no changes in yield over the next year. Both assumptions will probably not hold. But, this does not take away, that as long as markets remain so calm, investors will probably be attracted to the additional yield high yield bonds offer.